The London Cycling Campaign will be organising another protest ride tonight to call for more space for cycling on London's roads. On the morning of Monday 15 July 2013 another Londoner was killed under the wheels of a lorry in a street that provides no dedicated space for cycling. We send our deepest sympathy to family and friends of the latest victim, who has no yet been named but is believed to be a man in his forties. In response to this shocking death in Holborn today, the London Cycling Campaign is organising a second #space4cycling protest ride on Tuesday 16 July 2013 at 6.30pm, starting at Russell Square (see map below). Only last Friday, 1500 people rode through Aldgate to protest at the lack of safe space for cycling where a 20-year-old was killed cycling on 5 July. LCC chief executive Ashok Sinha said, "Three Londoners have now been killed in three weeks, all of them on busy roads that provide no dedicated space for cycling. "Mayor Boris Johnson must take swift and radical steps to redesign our streets to make them safe and inviting for cycling. "The evidence is clear: if the Mayor doesn't take urgent action, then more Londoners will die needlessly cycling on our city streets." This latest shocking fatality, at the height of the rush hour in central London, will devastate yet another family and takes the death toll of cyclists in London up to three in three weeks. As well as today's fatality, 41-year-old father Paul Hutcheson was run over cycling near Lewisham town centre on 24 June, while 20-year-old Philippine de Gerin-Ricard died at Aldgate on Friday 5 July on one of the Mayor's Cycle Superhighways. 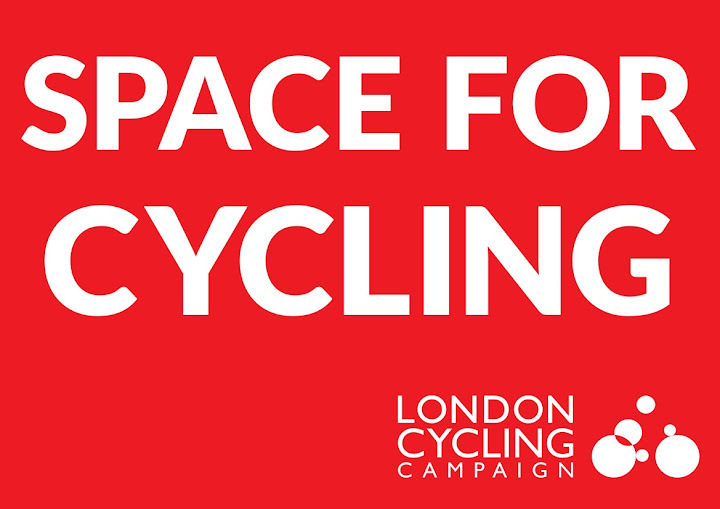 Download the Space for cycling placards to attach to your bike: placard 1, placard 2 on the ride. See the map of feeder rides organised by concerned protestors - and others are invited to add their start locations and times to the map created by @crispin_read.